This is France at its most spectacular! Our aspiration is to provide you a rich and rewarding experience you will remember for years to come. Take the opportunity to savor sumptuous and royal holidays while staying at three well-renowned castles. Live “La Vie de Chateau,” offering the feeling of being a noble guest of French royalty, and discover the incomparable beauty and magic of drifting back in time. Have you ever though about discovering France on a barge, sailing along its picturesque canals? It’s a travel experience beyond the ordinary. Take off on a cruising expedition on the canals of France through magical places, ancient towns, castles, and vineyards. which combine all the amenities of a luxury hotel and the friendly ambiance of a country inn. The barge very quickly becomes a familiar home away from home, with friendly staff, meals and no need to pack, repack and move from place to place, the barge travels in a slow and relaxing pace. perpetually snow-capped Swiss Alps. The scenery has an almost timeless quality, not only with blue lakes and soaring mountains, but also with flowers, woodlands, historic hamlets, and traditional fishing villages. Embark on a journey, which traverses three legendary lakes within Italy and Switzerland, where splendors and contrasts delight in equal measure. Lake Lucerne, Lake Como, Lake Garda are definitely intriguing by their different characters and we guarantee a discovery tour in this unique region revealing an incomparable beauty. Discover the Villa l’Olmo, located just outside Florence, in the middle of beautiful pine forests among the olive groves of Chianti. The property, created to provide a luxurious atmosphere, offers an elegant haven in private apartments and villas. Come to the heart of Tuscany to learn the secrets of its traditional fine cuisine and discover its distinctive wines, while savoring the excursions and the beauty of its surrounding region. The countryside of Tuscany stretches from beautiful regions where chestnut, beech and oak woods proliferate and fortified villages perch on hills to some of the most gorgeous coastlines of Italy. Its cities are among the greatest cultural treasure houses of Europe: from Florence, home of the Renaissance movement, to the medieval splendors of Romanesque Lucca, to the magnificent cathedral of Siena and to the ancient hill-town of San Gimignano. We are glad to introduce you to some of our suggested itineraries and to help you to organize an individualized tailor-made trip. Let us assist you with the smallest details such as the best restaurants that shouldn’t be missed, the most beautiful sites, and our knowledgeable friendly guides. We are committed to make your clients’ journey a truly memorable experience. The very name suggests the exceptional nature of its location: this 5-star Patrician villa is situated a few steps from Piazzale Michelangelo, with a unique and sublime view of Florence. This exclusive property is surrounded by an Italian style garden, a large panoramic terrace, and a park sloping down towards the Arno River. This beautiful hotel shows a trendy and sophisticated ambience, with 18 exclusive rooms, including suites, and provides outdoor dinning service on the terrace and by the swimming pool, overlooking Florence. The exclusive bar area is highlighted by a light honey color with a background of lounge music, creating the perfect atmosphere for guests to meet and socialize. Two large glass doors lead from the garden to the gourmet restaurant, which offers a refined and unconventional regional cuisine, skillfully enhanced with oriental spices and great creativity by Chef Andrea Accordi. 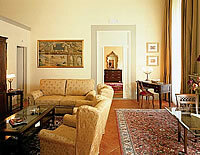 The Monna Lisa Hotel is located in the ancient center of Florence. This elegant Renaissance palace is furnished with fine antique furniture, old oil paintings and a number of art treasures, including neoclassical drawings and statues by Giovanni Dupre (1817-82), the famous sculptor from whom the owner’s family is descended. The hotel is an attractive and unusual establishment, perfect for guests who wish to have a pleasant stay in a delightfully unique atmosphere. There are just 45 guest rooms, all of which are stylishly decorated and are spilt between the old Palazzo and a newer wing across the garden. While featuring impeccably up to date conveniences, all rooms reflect the bygone style and coziness of the hotel. By walking though the shady gardens, guests literally step out into the heart of ancient Florence. Indeed the hotel is just a short walk from the famous historic building, the Duomo. Built in the south area of Florence in 1967 and recently meticulously refurbished, the Lungarno Hotel has recently enhanced the character that made it famous over the years. The view on the Arno River and over the city is unique. This magnificent property, famous for its attentive and discreet service, offers 73 splendid and luxurious guestrooms, including 12 suites and 1 Presidential suite. Guests are surrounded by exquisite objects, antiques and original paintings with an atmosphere of real elegance. The 'Ristorante Lungarno' has a panoramic view on the city where you can savor the fine local cuisine. The Palace belonging to the aristocratic Feroni family, dates back to the 1500's and is located in the historical centre of Florence. Under French rule, it was let to an important French dignitary who held sumptuous receptions and celebrations there in honor of royal visitors. At the end of the 18th century, the Palazzo was purchased by the present owner's family who made in there residence as well as one of the most important antique galleries in Europe until just a few years ago. The present owner has transformed his Florentine palazzo into a historical Palace-Hotel allowing a select clientele to enjoy elegant hospitality and holidays in exclusive suites. The owner can offer his guests the best, thanks to his experience travelling all around the world, staying in hotels, castles, palaces and country hotel. Palazzo Magnani Feroni with its eleven luxurious, carefully restored suites offers all the comforts of the third millennium, including 24-hour service, while allowing guests to experience the luxuries of aristocratic Florentine families. In the heart of downtown Florence, just a few steps from the Renaissance church of Santa Maria Novella, JK Place is an absolutely special hotel experience. This elegant habitat, which joins atmosphere with scents from the past, offers precise and decidedly contemporary comfort, and follows a great philosophy of hospitality. There are only 20 rooms, which possess exquisitely rarefied décor, an understated style and an admirable luxurious interior design, created by the architect Michael Bonan, well known on an international level. The reception is in a splendid library of geometrical black woodwork, inspired by the 16th century. The breakfast room is an old courtyard stylishly covered in glass and there is a relaxing terrace on the top floor reminiscent of both the Mediterranean and Africa.